In Shimokitazawa, you’ll find small theater halls, live music venues (known as ‘live houses’), bars, secondhand record and clothing shops, and stores offering miscellaneous items from the 70s and old animation-themed toys. Many shops express the ingenuity of their young owners, such as the convergence of multiple venues and user-driven items, (ie combining a cafe and a record shop or an outlet for small handmade items.) 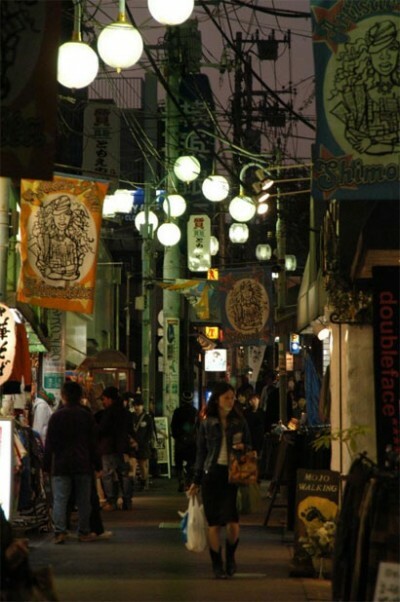 Every February the month-long Shimokitazawa Theater Festival showcases plays performed at eight small theaters, and the Kitazawa Music Festival in July features live music in every alley throughout the town. Animated cultural festivals include the Tengu-matsuri Festival honoring the mythical Tengu, and the Mikoshi-matsuri (portable shrine) Festival. As the magazine further states, “it is the favorite destination of sophisticated vintage shoppers, record collectors, musicians, artists, students, freelancers, lovers, and other creative types. The ‘Shimokitazawa experience’ is a lifestyle rather than a fashion-style. Indeed the area has served as an ‘incubator’ for many Japanese artists and musicians. From one of its creatives, ““It’s the hippest place in the city where people who say no to the commercialism… you won’t see Gucci or Vuitton here. It’s vintage-antique-used-retro-pop-cool-jazz-indies that defines what this town is about. It’s the basement and attic of Tokyo. Sadly and surprisingly, various government and commercial entities are attempting to replace the neighborhood with an auto-oriented boulevard – hopefully they learn from Dublin’s successful Temple Bar District, a natural cultural district that was not only saved, but is now a major cultural and economic destination for the city (however, perhaps too much so).